In 2006, the U.S. Federation for Middle East Peace organized its 3rd Annual International Peace Conference under the auspices of his Excellency Mister Amer Mousa, Secretary-General for the Arab League Headquarters in Cairo, Egypt, and the International Muslim Youth Organization. 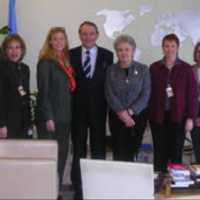 February 2006- U.S. Federation for Middle East Peace (UFMEP) hosted a panel discussion on "Human Trafficking in the 21st Century" as part of the 50th session for the Commission on the Status of Women (CSW) with H.E. Mr. Jan Eliasson, President of the sixtieth session of the United Nations General Assembly. February 2006-U.S. Federation for Middle East (UFMEP) hosted an event titled "Widows in Islam" as part of the 50th session of the Commission on the Status of Women (CSW). 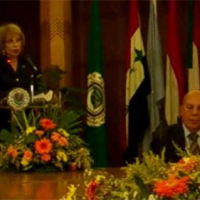 UFMEP President, Mrs. Salwa Kader, moderated the event discussion. The panel focused on the variety of adversities widows face in Muslim countries and further explored their rights under Islamic jurisprudence.